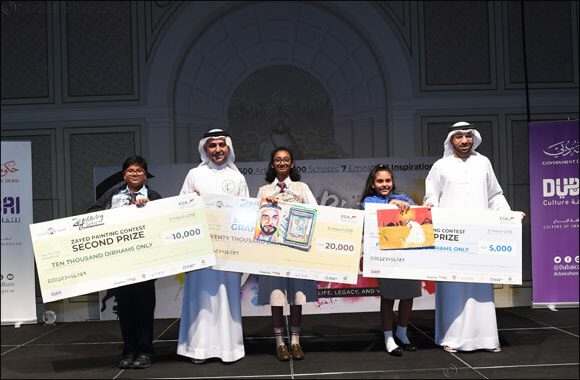 Dubai, United Arab Emirates, 02 April 2018: Dubai Culture & Arts Authority (Dubai Culture), the Emirate’s dedicated entity for culture, arts and heritage, has supported the ‘Zayed Painting Contest 2018’, which was launched by Infinity Event Management and aims to assemble student contributions from 100 schools across the UAE. One winning painting was selected from each school and entered a grand competition, which included a total of 100 paintings. The contest reflects the values of the ‘Year of Zayed 2018’ initiative by educating students and creating a higher level of understanding about the life of the late His Highness Sheikh Zayed bin Sultan Al Nahyan, the Founding Father of the UAE, on the occasion of his centennial birthday. The contest also encourage emerging artists by allowing them to present their work to the general public and a wider audience that is interested in the UAE’s artistic landscape. The winning paintings will be presented through a special art exhibition that will be held for six days in Dubai. Upon the contestants’ completion of the artworks, the paintings will be collected for publication in a book to congratulate the talents for what they have created and promote their creativity across the nation.